Slither.io tries to combine the mobile game of the 90s Snake, the gameplay from the Curve Fever and last year's hype of the Agar.io. In Slither.io, you try to eat as many luminous points as possible, so that your snake grows. Here, we have some tips and tricks summarized for you, which help you quick match entry. Once you have increased in size, you would of course collide with other snakes. As a strategy it is suitable, for example, the encirclement. Addiction simply smaller opponents near you and wind you circle around one of them until your opponent has no alternative and dissolves in colorful light dots. In the mobile versions of Slither.io, you must tap the SpeedBooster twice on the touch screen and leave your finger on the screen. In the browser version of the game you can increase the speed by pressing the left mouse button. The SpeedBooster your snake loses though at length, but there are also advantages. If you want your enemies circling for example, help the SpeedBooster, so you can move from the adversary. You can also get out of sticky situations with the Speed Booster. Also you can use the Speed Booster to move significantly slower in the longer queues. Therefore, increases your speed to overtake the great enemies then ensure that the huge enemies collide with you. Once a giant snake dies in Slither.io, the opposing pack sniffs the course immediately. Therefore, wait until the end to reach the battlefield, so you don’t collide in the hectic fray accidentally, then you can take the remains. 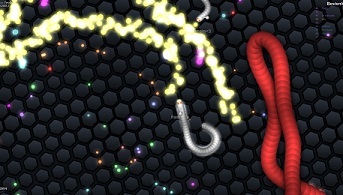 Once you have reached a certain size in Slither.io, you chase the other players more aggressively. It is therefore advisable that you move to the level limits, because there is less going on than in the center. Also, you can draw circles around you to hide your head, thereby also increases the chance that an opponent collides with you. Official Cheats for Slither.io does not yet exist. Once the developers release official cheat codes, we extend this article accordingly.